I was scheduled to eat pasta with sauteed vegetables for dinner this spring and I don't know what happened, but alla sudden I don't want to eat pasta. Also toast, which is a shocker. Toast was my dog, man. The only bread product I like now is bagels. Don't be horrified, but I've been pouring off the fat from my baked chicken into a jelly jar and using it to make this spinach, and it's really good. I don't use any more chicken fat than I would, say, olive oil, so caloriewise it's the same difference; so it's just down to how you feel about animal versus vegetable fat. Or if you're a coconut oil family, that would also work just as well. Heat a spoonful of fat in a skillet over high heat. Add spinach by the handful to the skillet, letting it cook down between handfuls. Cook the entire bag of spinach like this. Make a hole in the spinach and crack the eggs in the hole. Cover the skillet and let the eggs baste to your liking. 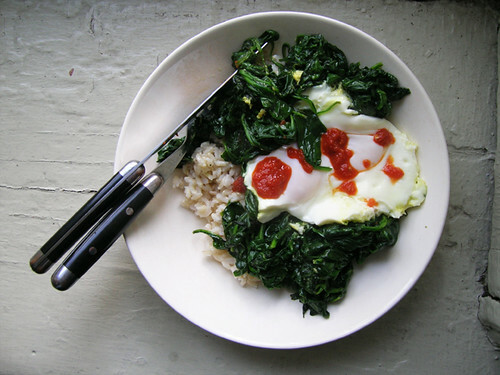 Scoop the eggs and spinach over rice. Sprinkle with sriracha sauce.